Griffith Observatory features space-related exhibits, star shows in the planetarium and some of the best city views in Los Angeles. The observatory gets high marks from most of its visitors. Visitors who review the observatory online give it very high marks. The science exhibits and planetarium shows are great. The free admission makes them accessible to everyone. 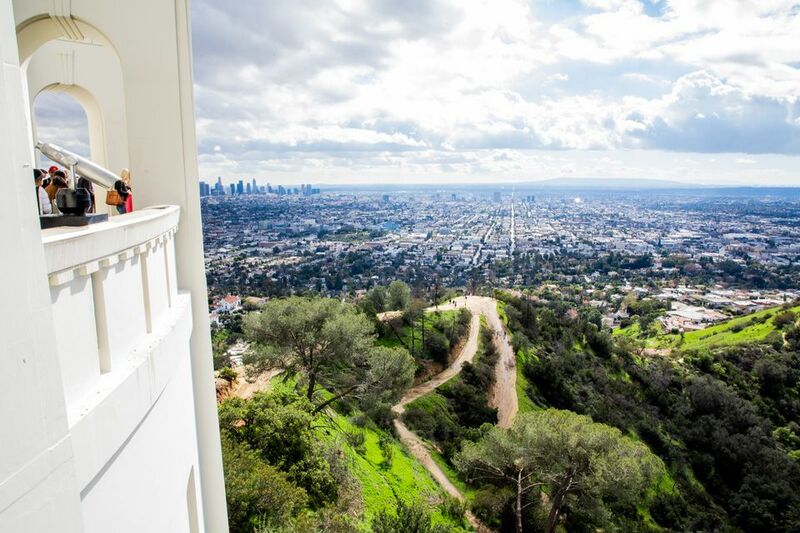 Even if you're not into outer space or science, the Griffith Observatory is the place to go for spectacular views of downtown LA and the Hollywood Sign. A small minority of reviewers say it's boring. For them, even the views aren't enough. It might be the same for you. Others complain about crowds and finding a parking place on a busy day or a clear evening. In fact, traffic a big reason not to go. Locals sometimes give up in frustration at the long lines of cars competing for the all-too-few parking spaces. If you don't have patience or time, you might want to skip it and avoid the frustration. The exhibits include some fun facts and interesting science. Taking time to stop and understand just one small exhibit (like the cloud chamber) can be enough to make a science geek's day. On the main floor, you can get the answers to all those pesky questions: why the moon has phases, what causes an eclipse or how tides form. They even have a piece of moon rock. You can also go to a planetarium show and look through their telescopes. Outside, you can spend time enjoying the amazing views of the surrounding city. Walk upstairs and go around the outside gallery to see them all. They have a cafe, in case all that makes you hungry. Admission to the Griffith Observatory is free. You have to buy tickets to the planetarium show. They are sold only at the observatory and sell out early. Children age 13 years and older pay adult prices. If your child is younger than that but looks older, bring along something to prove their age. Or bring a student ID to get a reduced price. Many folks miss the planetary orbits inscribed in sidewalk out front, but they're a good way to get a sense of cosmic size. If you get there in late afternoon, you can stick around to see the sunset and city lights. During busy holiday weekends, check the observatory website to see if they are running extra buses. If you want to drive up, take Vermont Ave and Vermont Canyon Road to get there instead of Fern Dell/Western Canyon (which is the route your GPS may suggest). If you're in good shape, it may be easier to get to the observatory by hiking the West Observatory Trail. Get the route here. It's a 2-mile hike with a 580-foot elevation gain, on an easy-to-follow fire road. The Griffith Observatory planetarium show isn't designed for small children. Kids less than five years old are admitted only to the first show of the day. The Griffith Observatory is open after dark, and you can get great city views from outside. Bring extra clothing in case it cools off too much. If you want to take photographs, you can use a discreet tripod, but no other bulky equipment. Read their guidelines. The Griffith Observatory frequently hosts special Star Parties and other events which are listed on their website. Griffith Observatory has appeared in many films, but perhaps its most memorable role was in the ending of Rebel Without a Cause. Other Griffith Observatory film credits include Transformers, the 1984 Terminator film, and Jurassic Park. The Griffith Observatory is in Griffith Park. You can get to it through the Vermont or Fern Dell entrances. Park in the Griffith Observatory parking lot or on the nearby streets. See the tips above for the best route to take when the streets are busy. The Fern Dell entrance closes at dark—after that, use Vermont. In early 2017, the City of Los Angeles implemented new parking rules and traffic controls at the observatory. The implemented parking fees for all of the parking spots in the observatory lot and along the roads nearby. You'll find pay stations nearby that take cash and credit cards. The parking fees help pay for expanded bus service to the observatory. DASH Observatory buses make 10 stops between the Metro Red Line Vermont/Sunset station and along Hillhurst Avenue in Los Feliz, stopping at the Greek Theatre and the Observatory. And best of all, the fare is less than a dollar per person.